Outline: The reality of Jesus Christ; He is alive and near to us, His power and love; man's sin; forgiveness; eternal life. Behaviour of a true Christian; trust. God's promise of help in all situations. Greetings to you, my friends. I have a very important word to say to you. Will you sit down and listen? It is about Jesus Christ. What comes to your mind when you hear that name? Do you think of the Son of God, Who died on a cross for your sins? 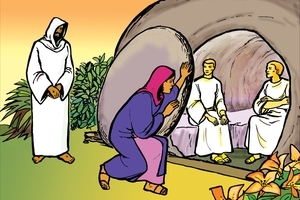 It is true that He did, but the wonderful thing is that He arose from death. He is alive today, just as truly as He lived on the earth long ago. He sees you and hears you right now, although you don't see Him. He is watching over you every minute. Do you think of Him as your very best Friend? Do you really know Him? Perhaps you think He is far away, and doesn't notice what you do, and you can live as you like. But this is not true. He loves you, and He wants very much for you to love Him. He wants you to leave the ways that God does not like, and to follow Him carefully. We all know that we do things that are not good. We try to stop, but we are unable to. Many people say that which is not the truth. They take things from others which do not belong to them. Some commit adultery, some kill people, some get drunk and most people get angry or do other bad things. God says that all these things are sins. Some things appear to be bigger (worse) sins than others, but God wants us to turn away from all of them. We cannot do this by ourselves. Only Jesus can help us. It was because of our sins that Jesus had to die, whether they were great sins or small ones. He gave His blood so that we could be changed. His death is wasted if we do not allow Him to forgive us and cleanse the sin from our hearts. He expects us to turn away from sin. Now He is alive, and watching for us to talk to Him. If you will invite Him to live in your heart, His Spirit will come into you and cleanse you. He will live in you and make you like a new person with new ways. He will give you everlasting life. God's Word, the Bible, says, "God so loved the world that He gave His only begotten Son, that whoever believes on Him should not perish, but have everlasting life." This does not mean that your body will never die. It means that whoever believes on Jesus for the forgiveness of his sins, will not be punished when he dies. He has God's life in Him, so when he dies, he will go directly to the wonderful place that Jesus is preparing for him in heaven. He will be alive there. The Spirit of God in you will help you to do the things that please God, and make you strong to refuse what is not good. Because Jesus loves us so much, we should love Him with all our hearts, and try always to please Him. We should also be kind to others, even if they treat us badly. This is truly the way of Jesus, because He gave His life for us, even when we were his enemies. The Bible says, "Love your enemies; do good to those who hate you." "Return good for evil." We can only do this when we have the love of God in our hearts. If you let His Spirit control you, He will help you not to be angry or proud or jealous. He will fill you instead with kindness and goodness, meekness and peace and joy. He will also protect you so that you do not need to be afraid. He will help you if you have trouble. He will comfort you if you are sad or sick. He will protect you from evil spirits. When Jesus died, He broke the power of Satan. Trust in the blood of Jesus, and you will be safe, because that is what defeated Satan. Jesus is stronger than all others, and He loves us very much. He also likes for you to talk to Him, just as you talk to a close friend. Talk to Him at any time, in any place. He will always help you if you are following Him carefully. He will guide you when you have problems. He will help you to use your time and strength and money well. He tells us not to make it a thing of importance to get many possessions, but to put the things of God first in our lives. You will want to show by your life and your home that Jesus is living in you. When others see your good works they will know that He is alive, and that He can help them too. GRN has recorded a version of this script in 28 languages and dialects. See full list.